The China Association of Automobile Manufacturers cut its 2015 vehicle sales growth forecast for China in 2015 to 3 percent from 7 percent. Automakers like GM with volume brands have already responded to the slowdown by cutting prices and increasing discounts, squashing profit margins. Shock waves from a drop in Chinese car demand are reverberating in Wolfsburg, Germany, and Detroit, where Volkswagen AG and General Motors are feeling the effects of a slowdown in a market that has been their big profit engine. Both Volkswagen and GM are heavily exposed to China, which remains a growth market, but where sales have slowed considerably in recent months. 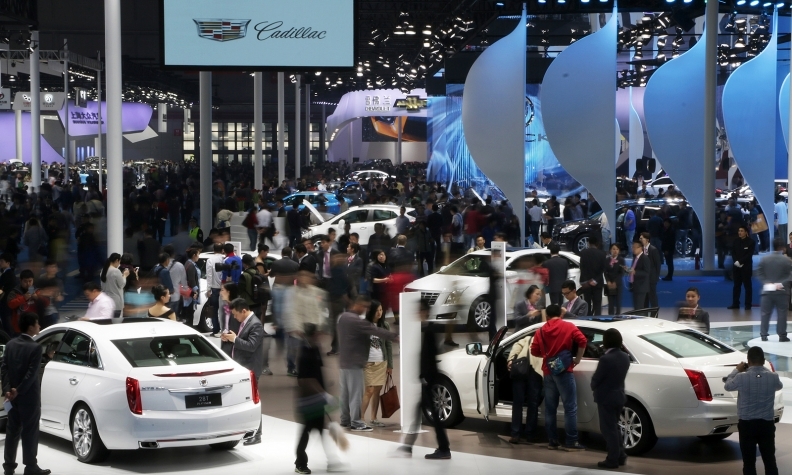 A leading trade group has cut its 2015 forecast for China vehicle sales industrywide. VW and GM depend on the country for a large chunk of their profits and cash flow, and analysts say neither company has a convincing story to tell about how to offset a slowdown in the world's largest car market with other parts of their business. Barclays downgraded GM's stock to "equal weight" from "overweight" on Thursday, saying it was likely to face the sharpest of the China headwinds among the U.S. automakers and auto parts makers it covers. "It has a lot to lose in a Chinese decline ... There are few catalysts on the horizon," Barclays analysts wrote in a note downgrading the entire U.S. auto sector to "negative" on China risks. Volkswagen depends on China for more than half of its net profit and 71 percent of its free cash flow including income from joint ventures and royalties, according to auto industry analysts. GM generated 40 percent of its net income and 20-30 percent of its operating cash flow in China last year, according to Barclays. China's passenger car market, the world's biggest, is dominated by foreign players led by VW and followed by GM, Hyundai, Toyota and Nissan, but the share of sales captured by domestic players such as Great Wall is rising. Volkswagen is vulnerable to a consumer shift toward less expensive vehicles as Beijing cracks down on displays of wealth and first-time car buyers in second-tier cities favor cheaper local models. VW's profits have largely depended on its premium Audi brand, whose performance in China has worsened over the past seven months, while the VW brand lacks a fresh range of SUVs and crossovers, China's fastest-growing vehicle segments. On Thursday, Audi said it was reviewing its 2015 Chinese sales target in the latest sign that the downturn is more severe than expected. "Audi's status as the brand of choice for Chinese bureaucrats used to be a boon but is now turning into a snare," IHS automotive analyst Henner Lehne said. The luxury downturn has already hit German premium brands BMW and Audi. Audi, BMW and Daimler's Mercedes-Benz command between 70 and 80 of China's premium market, where they earn 30-50 percent of their profits. Now the malaise for foreign carmakers is spreading to the mass market, where local players are gaining share. Last week, the China Association of Automobile Manufacturers cut its vehicle sales growth forecast for 2015 to 3 percent from 7 percent. Automakers like GM with volume brands have already responded by cutting prices for vehicles and increasing discounts, squashing profit margins. "We think the pricing environment is likely to deteriorate sharply as dealers are forced to clear excess inventory and capacity growth outpaces sales growth," Barclays wrote in its note. But GM is not considering layoffs or big production cuts, a Shanghai-based spokeswoman for the company said in response to Reuters questions. VW, together with its local joint venture partners in the country, has pledged to invest 22 billion euros through 2019 in new plants, models and equipment in China, reflecting the German group's commitment to future expansion. The problems in China threaten to expose structural issues at both VW and GM that have been masked by the Chinese boom. VW is already trying to generate 5 billion euros ($5.5 billion) in cost cuts it has promised at its core brand, with a high cost base in Germany. It is also failing to make significant inroads in the North American market. The departure in April of long-serving chairman Ferdinand Piech was considered a catalyst for change but CEO Martin Winterkorn has yet to present a new plan. Without the China effect and in the absence of any meaningful operational improvements, VW would have difficulty paying a dividend, Credit Suisse analysts said. "Our analysis shows that Volkswagen would struggle to cover its dividend without any contribution from China," its automotive analysts wrote on Wednesday. Barclays said GM was now unlikely to meet its targets for the region, and it expected a decline of 1 percent in volume sales this year versus a company forecast of an increase of at least 6-8 percent. The bank said it expected GM management to pull its mid-term target of a sustainable 9-10 percent profit margin in China, adding that it saw little room for GM to compensate in other regions such as North America or Europe. "With little offset from the rest of the company, we see a cheap valuation and rich dividend as largely irrelevant," Barclays said. In contrast to GM and VW, Japanese carmakers have made smaller inroads in China and so are not as exposed to the effects of the slowdown. "Even as Germans were having parties, we [Toyota and other Japanese companies] did some belt-tightening and other trench work," a senior executive for Toyota's China operations told Reuters. "After dealing with a big sales slump in 2012 because of the soured bilateral relations between Tokyo and Beijing, we're used to slow growth."